The city has agreed to pay $19,000 to settle a woman’s slip-and-fall lawsuit, according to municipal records. 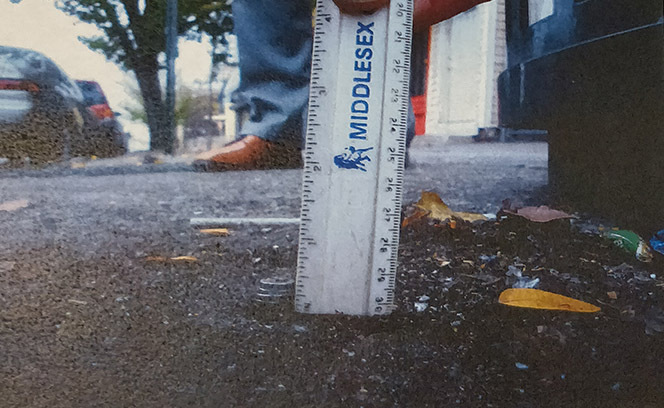 Miriam Andujar, who badly injured herself after tripping and falling over an exposed bolt (pictured) that was used to secure a garbage receptacle outside of 350 10th Avenue, filed a lawsuit against both the municipality and 10th Ave. Liquors and Food Mart. On Oct. 30, 2013, Andujar made a purchase at the liquor store, owned by Luis Marquez. After she exited the business, she tripped and fell on an exposed “protruding steel bolt that was set into the concrete sidewalk,” according to her lawsuit. The liability for the incident is shared by both the city and the business, according to a non-binding arbitration award issued in Apr. 2017. Andujar was awarded $125,000 by an arbitrator, who divided the liability 90/10 between the business and the city. Under the arbitration award, the city had to pay 10-percent of the total award. The city argued it was the business’ responsibility to maintain a safe sidewalk. “The arbitration helps you settle,” said Domenick Stampone, the city’s chief attorney. He said it provides a “reality check” on exposure to all sides in a case. The city settled the case in late May. “At the time they had settled with us, they had not reached a resolution with the property owner,” said Stampone. Marquez and Andujar were moving to trial as of late May. The city was incurring legal expenses as the case continued to drag on. To cut its loses, municipal officials decided to settle with Andujar rather than incur large sums in legal expenses. A total figure as to how much the city spent defending its self in the case was not immediately available on Tuesday. Everyone was probably in cahoots. Greed will be the downfall of this once great country.